When staying at this villa, you will be privy to a one-of-a-kind island deck with deck chairs located just above the sea. What an enjoyable way to relax after playing in the sand on Lorient or Saint Jean beaches. For a change of pace from the beach, stores and shops are just three minutes away by car. You can also opt to work out at the villa’s air-conditioned mini-gym or take advantage of a relaxing massage in the shade. There are limitless opportunities to fill your vacation days with fun and pleasure when you stay here. This villa is hugely popular with our readers who often comment that they plan to return next season. Beach access and snorkeling in front of villa! 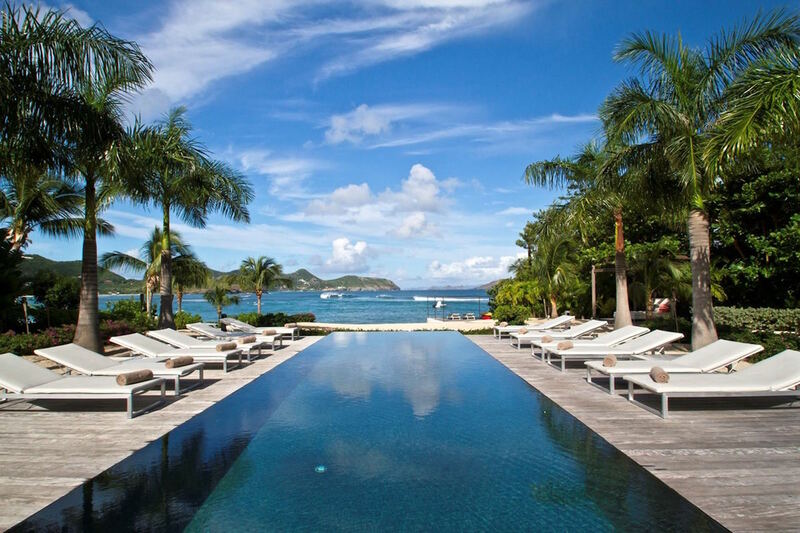 Palm Beach Villa is a 5-bedroom residence villa on Lorient, St. Bart’s, located right on the seafront of the beach of Lorient Bay, offering views of three islands, and St. Martin in the distance. The villa has views from any room in the house, including the bedrooms. It is the only villa to feature a deck on the seafront with deck chairs so guests can relax with the waves lapping the shore below. There is also access in to the water for good snorkeling or kayaking. Guests love to dine-in and enjoy the kitchen outfitted for a gourmet cook. Four en-suite bedrooms are located in the main house and include two master (king) suites at either end; one connects to another (king) bedroom suitable for adults or children; this bedroom also connects to the living area as does the 4th (queen) bedroom. All have en-suite baths offering special features; the queen bedroom’s bath has both a tub and shower. The 5th bedroom is housed in a private bungalow (10 feet from main house) ensconced in a garden setting. En-suite, it also features its own kitchenette, sitting area, and covered dining terrace. This bedroom offers a double four-poster bed. The outdoor living areas are spacious and include a dining table that seats 12. A waterfront deck and private access to the beach add to the charm of the villa. Palm Beach Villa has two pools: a heated, infinity, mirror image and a shallow wading pool. What a great spot to sit and sip a Planter’s Punch on a lazy afternoon. The sound of the waterfall provides a soothing soundtrack. There is also an air-conditioned mini-gym and a shady massage area just beyond the pool with an adjacent outdoor shower. Plasma TVs with US Direct service and iPod docking stations. Gas BBQ, wine cellar, espresso machine, fax, iron and ironing board and a one seater and two seater kayak.